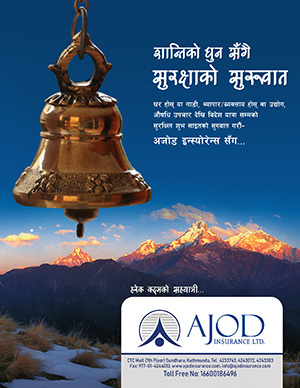 The 31st annual general meeting (AGM) of Nepal Investment Bank Ltd (NIBL) held on Tuesday (24 October) has decided to distribute 40 per cent dividend — 15 per cent share dividend and 25 per cent cash dividend — on its total paid-up capital to the shareholders. The AGM also elected Kabi Kumar Tibrewal, Prajanya Raj Bhandari, Surya PrakashLalShrestha and PrithiviBahadurPande as directors representing promoter group, according to a press releaseissued by the Bank. In fiscal year 2016-17, NIBL earned operating profit of Rs 5.24 billion before provision as compared to Rs 4.13 billion recorded in the previous year. The net profit of the bank grew by 22.1 per cent to reach Rs 3.11 billion against Rs 2.55 billion of the previous year. NIBL’s paid-up capital will reach Rs 10.62 billion (after issue of 15 per cent bonus shares in fiscal 2016-17). NIBL’s deposits increased by 15.7 per cent to reach Rs 125.66 billion, while total lending of the bank surged by 22.6 per cent to Rs 106.68 billion in the review period. The bank has been striving for growth, enhancing customer service experience and strengthening relationship with all its stakeholders. NIBL has acquired Ace Development Bank to provide consolidated service to further enhance customers’ need and expand nationwide reach. The bank has a customer base of over 836,000 being served through a network of 61 branches, 99 ATMs and four extension counters. To provide enhanced customer service to its customers, NIBL jointly with Nepal Electricity Authority (NEA) has agreed to make all payments of electricity bills through any NIBL branch and online banking services from this year.